We like to talk about power in climbing, and we like to think of ourselves as training “power” when we boulder, but is that really what we’re doing? The most powerful athletes in the world compete in activities lasting fewer than ten seconds. The athletes I am talking about are Olympic lifters and sprinters. These athletes and the coaches who train them know how to develop real power…so why haven’t boulderers been paying attention to the lessons to be learned? First, training for bouldering has to be separated from bouldering as training if big increases in power and strength are your goal. 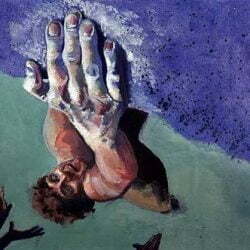 We’ve been on the right track; bouldering helps us develop more power than route climbing does. But ultimate levels of power are developed in sets of activity much shorter than the time needed to complete the average problem. We diminish the body’s ability to develop power by climbing too long, even on short boulder problems or campus board sets. The length of boulder problems is dictated most frequently by either the height of your climbing gym or the height you’re willing to climb while facing a ground fall. Neither of these takes into account what’s going on physiologically. 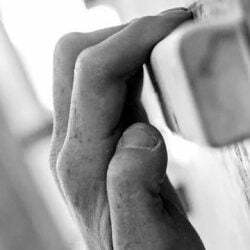 When we broadly categorize bouldering as power and route climbing as endurance, we’re deceiving ourselves into training incorrectly for these facets of our sport. The average gym boulder problem is about 5 moves too long for optimum power and strength development. What I am suggesting is training power with power development in mind and leaving actual boulder problem completion to another session. Short Problems: As I alluded to above, these would be two to three max-difficulty moves done on a boulder or at your gym. 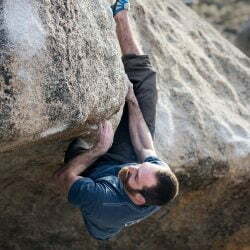 Since bouldering fails to stress both sides of the body equally, I’d suggest a circuit, switching between 3-4 problems in a single session, doing one “set” on each before changing problems. With this exercise, you can work on strength, making hard, static moves or using small holds, or you can develop power, making explosive moves on slightly larger holds. I don’t usually differentiate between the terms strength and recruitment in training the muscles of the forearm; almost all forearm strength gains in advanced climbers come from greater recruitment. Tiny Holds: This set is a grip-specific exercise, think of them as “heinous clings.” Pick a set of holds that you can’t quite hold onto in a deadhang, then, as Jim Bridger used to say, “give ‘er Green River.” You might not be able to even hang the holds in the first few training sessions. A good rule of thumb: if you can hang for more than two seconds, the holds are too big. Work your 2-3 weakest positions. It’s easier to get injured on these sets than it is to get sponsored by Five Ten, so be careful. Warm up for a long time, and stop at the slightest hint of injury. The Move: One step better than hanging from terrible holds is making one desperate move. This should be an all-out maximum move, followed by 2-4 minutes rest. 4-6 attempts per workout, maximum. The best set-up I’ve ever seen is the “Swiss Board.” This is a mini Campus Board about two feet wide and six inches tall. At the bottom lip is a terrible (1/3″) crimp and just 4 inches higher is a smaller one. Here’s what happens next…you try a few of these exercises and you’re not even pumped. Read on. Maximum strength and power are best developed via alactic training, short-duration efforts of very high intensity. These bouts are over so quickly that the body doesn’t have to start utilizing its endurance energy pathways ( i.e. glycolysis or aerobic metabolism). The energy required for these efforts comes almost completely from ATP stored in the acting muscles. 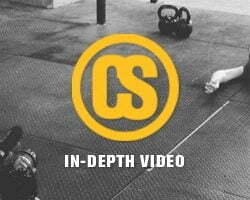 Long rest periods allow replenishment of these resources between sets. Charlie Francis, a Canadian track coach often regarded as the best sprint coach of all time, routinely trained his 100 and 200-meter athletes at 30 to 60 meter distances for precisely this effect. Running a full 100 meters (around 10 seconds for elite-level runners) diminishes power output and increases production of waste products. By avoiding those few extra seconds of sprinting, they could get more high-quality work out of each athlete. The exercises listed above work the same way. By avoiding getting pumped, you’ll be able to develop more power by not getting so tired. The end of the sets come when power declines – you’ll know when. Keep in mind that power isn’t the whole game. You’ll need to build on top of the power base to be able to apply this training to boulders and then to routes. More than anything, remember that training is not a fix, but a change. Doing a few power-related exercises occasionally will only get you injured. A well-planned and progressed season of power training will get you exactly what you’d expect…more power.